Beds: 1 king bed and full size pull out sofa. Fun awaits you at the Clover Island Inn! 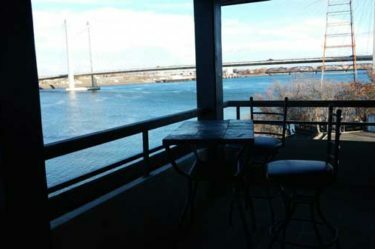 The Clover Island Inn is your Kennewick hotel, whether you’re here for business, sporting event, convention, golf or shopping and wine tasting. 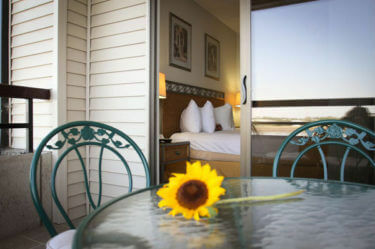 We are a full service, locally owned and operated hotel in Kennewick Washington, located on the Columbia River. 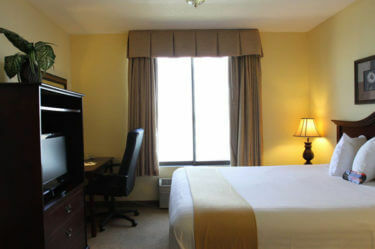 Our goal is to provide you, our guest, a great value and enjoyable stay. Our 150 sleeping rooms include four 4th floor suites with beautiful river views. Standard sleeping rooms are available with a river view or marina view. 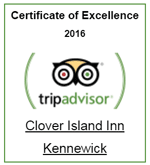 “We heard great things about the Clover Island Inn, and our visit confirmed their reputation. The rooms are lovely, the staff was accommodating, and the restaurant was superb. 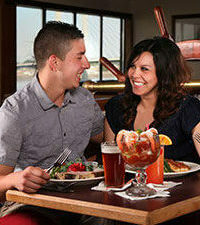 “We thoroughly enjoyed our romantic anniversary getaway at the Clover Island Inn. Between the beautiful sunset view from the restaurant and our room, and the terrific dinner in the Crow’s Nest, it was the perfect getaway. Perched atop the fourth floor of our hotel sits The Crows Nest Bar & Grill. Offering you the ambiance of the Captain's quarters of an old wooden ship and with panoramic views of the Columbia River, you can enjoy one of the finest dining experiences in town. NEW YEARS EVE PARTY | DECEMBER 31 with Stompin Ground!